Anwar al-Awlaki: "I Pray that Allah Destroys America"
Awlaki is routinely given the title of "imam" and is described as "a Muslim scholar." On film, he sits in front of an Islamic text or a Qur'an, reading from the Arabic text and translating into English. In reality, his credentials as an Islamic scholar are insubstantial. By his own admission, his Islamic education amounts to only a matter of months here and there. "We will implement the rule of God on earth by the tip of the sword." These words are among many coming from the pen and tongue of one of Islamic terrorism's leading proponents. Anwar al-Awlaki (Anwar Nasser Abdullah al-'Awlaqi) is not as well known in the West as Osama bin Laden, but for growing numbers of radical and radicalizing Muslims, he is a beacon. Osama bin Laden does not speak fluent English, but Awlaki is American born of Yemeni parents in Las Cruces, New Mexico and is fluent in both English and Arabic. He is an inspiring, clever orator who speaks directly to the concerns of young Muslims in the West, be they converts or born-Muslims like himself. So powerful is his appeal that he has been described as the "bin Laden of the Internet." In more practical terms, he was given the rank of a regional commander of Al-Qaeda in Yemen in late 2009. No scholar with a grain of Islamic knowledge can defy the clear cut proofs that Muslims today have the right—rather the duty—to fight against American tyranny. 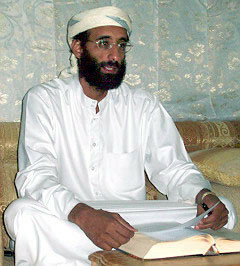 Awlaki has a widespread reputation as a respected Muslim cleric. When Nidal Malik Hasan approached Awlaki by e-mail, it was ostensibly for "spiritual guidance" although it is reasonable to presume that Awlaki's counsel crossed the line into advice on jihad. Introductions to Awlaki's talks regularly feature him as a man of learning. He is routinely given the title of "imam" and is described as "a Muslim scholar." On film, he sits in front of an Islamic text, a Qur'an, or a work by thirteenth-century Muslim scholar Ibn Taymiyya, reading from the Arabic text and translating into English. He has, indeed, served as an imam in Fort Collins, Colorado, at the Al-Ribat al-Islami mosque in San Diego (1996-2000), at the Dar al-Hijrah mosque in Washington, D.C. (from 2001), and as Muslim chaplain at George Washington University. His talks and sermons are available in books, on CDs, and as YouTube clips. In the broadest sense, he stands in the first line of motivators for violent jihad of all kinds. His influence can be guessed at by the fact there have been almost three million viewings of these clips, perhaps as many auditions of online recordings, and a steady stream of glowing comments cheering on his exhortations to kill nonbelievers, especially U.S. troops or Israelis. As a result, he has been accused of being "a coordinator, even a facilitator, or talent recruiter if you will, for al Qaeda and all of its franchises" although in reality, his role may be less formal. According to the New York-based NEFA Foundation (Nine Eleven Finding Answers Foundation), a terrorism research think tank, "There is no other comparable pro-Al-Qaida, American figure who has such tremendous access to audiences or who has such credibility." Reports New York Times writer Scott Shane, "In nearly a dozen recent terrorism cases in the United States, Britain, and Canada, investigators discovered the suspects had something in common: a devotion to the message of Anwar al-Awlaki." The groups and individuals involved have included three of the 9/11 hijackers; the "Toronto 18" (2006); Shain Duka, one of the Fort Dix plotters (2007); the Somali affiliate of Al-Qaeda, Al-Shabaab; Nidal Malik Hasan (2009); Mohammed Hamid arrested on charges of organizing British terrorist training camps; and most recently, the Nigerian would-be bomber, Umar Farouk Abdulmutallab. Yet, much like Al-Qaeda operatives and other Islamists, Awlaki in reality has insubstantial credentials as an Islamic scholar. By his own admission, his education in Islamic subjects amounted to only a matter of months here and there with different ulema. A few months would have been much too short a time in which to engage in serious study, particularly the number of classic texts he claims to have read. But Awlaki's veneer of learning combined with his lack of formality may be a secret of his success. He does not carry the baggage of a regular scholar but speaks in clear English well larded with quotations in Arabic that display an apparent knowledge of Qur'anic and other texts. In his celebrated lecture, "The Dust Will Never Settle Down," for example, he addresses the question of what to do with nonbelievers who insult the Prophet Muhammad in any way, illustrating his theme with lengthy accounts of cases where Muhammad ordered or permitted the assassination of poets and others who had offended him. In measured, fluent tones, he gives a powerful impression of erudition, of an awareness of source materials, of Arabic texts, and historical understanding. So convincing is all this that he succeeds in turning acts of open treachery and assassination into religious virtues, as he states in a February blog entry: "I pray that Allah destroys America and all its allies." Awlaki was born in Las Cruces in 1971 to parents who had immigrated some years earlier from Yemen. His father Nasser held a master's degree in agricultural economics from New Mexico State University, a Ph.D. from the University of Nebraska, and was a faculty member at the University of Minnesota (1975-77). He later became the Yemeni minister for agriculture and president of San'a University. While this says nothing about whether Awlaki, Sr. was a Muslim radical, it suggests a home background grounded in education and a positive attitude toward learning. The Awlakis returned to Yemen in 1978 when Anwar was seven. By the time he returned to the United States in 1991, he had received some eleven years of schooling in a secular high school in San'a, along with children from other elite families, improving his Arabic to a high degree while retaining and advancing his English. He returned to the United States at eighteen and earned a bachelor of science degree in civil engineering from Colorado State University (1994), followed by a master's of arts in education leadership from San Diego State University. He worked on but does not seem to have finished a Ph.D. in Human Resource Development at George Washington University (January-December 2001). It is worth remarking on the close links between Islamic radicals and the sciences and technology as large numbers of terrorists and terrorist backers have studied for degrees in science, engineering, or medicine and have worked in these fields. Like others, Awlaki seems to have transferred a literalist understanding of scientific texts to a blind acceptance of Islamic material. He presents the Qur'an and other texts to his audiences as unquestionable sources of truth that demand the obedience and the dutiful action of the believer. Between June 1999 and March 2000, the FBI opened an investigation into Awlaki. He was already under suspicion as vice president of a San Diego-based Muslim charity, the Charitable Society for Social Welfare, considered to be "a front organization to funnel money to terrorists." He was now being investigated for fundraising for the Palestinian terror organization Hamas, for possible direct links to Al-Qaeda, and for a visit paid to him by a close associate of Omar Abdel Rahman, the blind sheikh behind the 1993 World Trade Center bombing. A Joint Terrorism Task Force in San Diego was eager to get enough on Awlaki in order to probe him thoroughly. A judge in Denver signed off on an arrest warrant on the grounds of passport fraud, but for reasons that are not known, the felony arrest warrant was rescinded by the Denver U.S. Attorney's Office in 2002. The following day, October 10, Awlaki returned to the United States from a visit to Yemen and was intercepted as a terror suspect at the JFK airport in New York (he was on a terror watch list), questioned but released on the grounds that there was no open warrant allowing security personnel to arrest him. Awlaki left the United States again soon afterwards and settled in London. Here, he embarked on a series of lectures at the Al-Tawhid mosque, a well-known center for radical preaching. His reputation seems to have risen by leaps and bounds: In June 2003, a year or so after his arrival in England, he was a guest speaker at a meeting of the Muslim Association of Britain (MAB), the official arm of the Muslim Brotherhood in the U.K. Following this, the MAB organized a series of meetings with Awlaki as speaker. In October of the same year, the Islamic Forum Europe (IFE), a major Islamist group with centers across Europe, invited him to speak at a major event, and two months later, Awlaki spoke at an event organized by the East London Mosque, a center linked to the IFE, with a reputation for Deobandi-style radicalism and an attachment to the teachings of the two great fundamentalists of the twentieth century, Abu'l-'Ala Mawdudi and Sayyid Qutb. Most worrying are his links to Islamic societies at several places of higher education, including City University, Westminster University, the University of London, and the Federation of Student Islamic Societies (FOSIS). Since then he has been actively promoted by "some of the United Kingdom's most prominent Islamist organizations." More disturbingly, he made a positive impression on some individuals who should have known better than to take him at face value, including Osama Saeed, chief executive of the Scottish-Islamic Foundation and a parliamentary candidate in the 2010 election. Saeed proclaimed that Awlaki "preached nothing but peace." Azad Ali, president of the Civil Service Islamic Society, a council member of the rights group Liberty, and an advisor on Islamic extremism to a Whitehall counterterrorism panel that provides advice to the U.K.'s director of public prosecutions and most senior prosecutor, spoke of his love for Awlaki and described him as "one of my favourite speakers and scholars." Both men have dropped Awlaki since the revelations of late 2009. It is time that the spotlight fell on the Muslim Association of Britain, particularly the key figures, such as Azzam Tamimi, Kamal el Helbawy, Anas Al-Tikriti and Mohammed Sawalha. All of them are connected to the terrorist organisation Hamas. The Muslim Association of Britain itself is a branch of the Muslim Brotherhood … It is militantly anti-Semitic and always has been. That his notoriety had by now reached the British parliament may have intimated to Awlaki that he was close to overstaying his welcome in the U.K. and that he might well face scrutiny from the British security services as he had done in the United States. He abandoned the U.K. in early 2004, flying with his wife and five children to Yemen where he resumed residence in his ancestral home in a southern province called Shabwa. He began to lecture at San'a's Iman University, an institution founded and maintained by Abdul-Majid az-Zindani, designated a terrorist by the U.S. Treasury and a sanctioned affiliate of Al-Qaeda by the U.N. The university is an institution with some 6,000 students, and is, in effect, a madrasa or school for Islamic religious instruction. Things took a new turn on August 31, 2006, when Awlaki was arrested by the Yemeni police. There has been dispute about the reason for this arrest, but one plausible explanation seems to be that Washington persuaded Yemen to take him into custody, providing an opportunity to interrogate him. In an interview for Cageprisoners carried out by former Guantánamo Bay inmate Moazzam Begg, Awlaki confirms that he was questioned by the FBI. The interrogation, he states, continued on and off for a year. Whatever the outcome of those interviews, no charges were brought, and Awlaki was released on December 12, 2007. It may well be the case that political influence was brought to bear, a possibility suggested by the fact that his name was found on a list of one hundred prisoners whose release was demanded by Al-Qaeda-linked militants in Yemen where the Awlaki tribe carries considerable influence. It is understood that the Awlakis provide protection for Al-Qaeda militants against the government. Awlaki himself is thought to be living in his home province, enjoying the same level of protection. Awlaki's role as a fomenter of violence was further publicized after the December 25, 2009 attempt to down an airliner on its descent to Detroit. The Nigerian Muslim responsible for the nearly successful bombing, Umar Farouk Abdulmutallab, is thought to have met Awlaki while studying at Iman University in San'a and appears to have been a fan of his talks. One report indicates that Abdulmutallab told the FBI that Awlaki had been one of his trainers at a remote Al-Qaeda camp in Yemen and that the two men had met during Abdulmutallab's final weeks of training and indoctrination. For a time, it was thought Awlaki had been killed in a raid on December 24, 2009, when Yemeni jets hit a meeting of leading Al-Qaeda operatives. The attack killed some thirty militants, including Nasser al-Wuhayshi, the regional Al-Qaeda leader, and his deputy Saeed ash-Shihri. Two days later, however, the FBI stated that they did not believe Awlaki had been among the victims. It would seem then that Anwar al-Awlaki is one of the most successful spokesmen for radical Islam, using a non-Islamic language and modern technology to spread his message on the widest basis possible. Muslims have exonerated him on the grounds that he has never done anything directly criminal, but it is clear that he achieves his results through the manipulation of others, men like Nidal Malik Hasan and Umar Farouk Abdulmutallab. When he preaches to radicals, the result is confirmation of their religious right to kill non-Muslims; and when moderate Muslims listen to his CDs and Internet broadcasts, his erudition, his conviction, and his rhetorical ability all combine to form an impression that it is godly to speak in this way and to carry out acts of violence. As Yemen acquires a reputation as a third base for Al-Qaeda, it is likely that Awlaki will resurface to play a leading role in the recruitment and motivation of yet more misguided young Muslims, not just in Yemen but worldwide. Update from May 23, 2010: Anwar Al-Awlaki, in his first interview with Al-Qaeda media, calls on Muslim U.S. servicemen to kill fellow soldiers. The Dallas Morning News, Nov. 29, 2009. Right Side News (Richmond, Va.), Jan. 1, 2010. The Washington Post, Dec. 25, 2009. ABC News, Nov. 21, 2009. The Yemen Post (San'a), Jan. 6, 2010. Statement cited in "U.S.-Born Islamic Cleric: Nidal Hasan 'Did the Right Thing,'" Jihad Watch, Nov. 9, 2009. "Moazzam Begg Interviews Imam Anwar Al-Awlaki," Cageprisoners (London), Dec. 31, 2007. See, for example, "The Shuhada of Palestine—Iman Anwar al-Awlaki," YouTube, accessed Feb. 8, 2010; "Imam Anwar al-Awlaki—Jihad Fi Sabilillah," YouTube, accessed Feb. 8, 2010. Right Side News, Jan. 1, 2010. Harry Smith, "Al-Awlaki May Be Al-Qaeda Recruiter," interview, CBS News, Dec. 30, 2009. "Anwar al Awlaki, Pro Al-Qaeda Ideologue with Influence in the West," Backgrounder, Nine Eleven Finding Answers Foundation (NEFA), New York, Feb. 5, 2009, p. 8. The New York Times, Nov. 19, 2009. Charles Allen, U.S. undersecretary for intelligence and analysis, keynote address at GEOspatial INTelligence Conference, Nashville, Tenn., Oct. 28, 2008. Douglas J. Hagmann and Judi McLeod, "The Fort Hood Massacre and 'Toronto 18' Connection," Canada Free Press, posted on The NEIN Blog, Dec. 16, 2009. The New York Times, Nov. 18, 2009. "Anwar al-Awlaki: ' Salutations to al-Shabab of Somalia,'" Dec. 21, 2008. The Times (London), Nov. 10, 2009. The Guardian (London), Feb. 26, 2008; Yassin Musharbash, Volker Windfuhr, and Bernhard Zand, "How Influential Is Yemen's Mystery Man?" SpiegelOnline (Hamburg), Jan. 11, 2009. CBS News, Dec. 29, 2009. Anwar al-Awlaki, "A Question from a Reader on My Islamic Education," Islamic Blogspot, accessed Jan. 15, 2010. Anwar al-Awlaki, "The Dust Will Never Settle Down," Dar al Murabiteen Publications, accessed Jan. 15, 2010. The Santa Fe New Mexican, Nov. 14, 2009. Scientific Training and Radical Islam: A Report by the Centre for Islamic Pluralism (Washington and London: Centre for Islamic Pluralism, 2008); Steven Schwartz, "Scientific Training and Radical Islam," Middle East Quarterly, Spring 2008, pp. 3-11; Malise Ruthven, A Fury for God (London: Granta Books, 2002), pp. 114-20; Declan Walsh, "The Mystery of Dr. Aafia Siddiqui," The Guardian, Nov. 24, 2009. Associated Press, Feb. 26, 2004. "Anwar al Awlaki, Pro Al-Qaeda Ideologue with Influence in the West," p. 5. ABC News, Nov. 30, 2009. On the mosque and its radicalism, see "Undercover Mosque," Channel 4 (U.K.), Jan. 15, 2007; Denis MacEoin, The Hijacking of British Islam (London: Policy Exchange, 2007), p. 95. Adrian Morgan, "Exclusive: Who Is Anwar al-Awlaki?" FamiySecurityMatters.org, Nov. 10, 2009. "Islamic Forum of Europe: Responding to the Call," accessed Jan. 26, 2010; Ed Husain, The Islamist: Why I Became an Islamic Fundamentalist, What I Saw Inside, and Why I Left (London: Penguin Penguin 2009), p. 23; Rebecca Taylor, "Islamic Extremists in the East End," Time Out (London), May 1, 2007. The National Post (Don Mills, Ont. ), Jan. 18, 2010; The Daily Telegraph (London), Dec. 27, 2008, Jan. 2, 2010; The Times, Jan. 4, 2010. Faisal Gazi, "Anwar al-Awlaki and His British Friends," The Spittoon, Nov. 17, 2009. The Times, Nov. 12, 2009. The Times, Nov. 1, 2009. Parliamentary Business, Hansard Debates, House of Commons, U.K., Dec. 18, 2003. See subjects taught, San'a's Iman University website, accessed Jan. 15, 2009. "Moazzam Begg Interviews Imam Anwar Al-Awlaki," Dec. 31, 2007. The Kansas City Star, Nov. 22, 2009. The New York Times, Jan. 2, 2010. The Times, Jan. 3, 2010. The Times, Dec. 28, 2009. Fox News, Dec. 26, 2009. Related Topics: Muslims in the United States, Radical Islam | Denis MacEoin | Spring 2010 MEQ receive the latest by email: subscribe to the free mef mailing list This text may be reposted or forwarded so long as it is presented as an integral whole with complete and accurate information provided about its author, date, place of publication, and original URL.